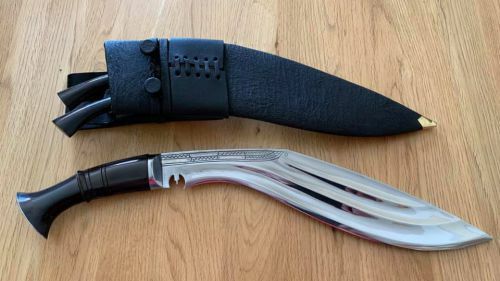 Tora's Tin Chirra is based on an old Gurkha Officers kukri. It comes with a triple fullered (Tin Chirra) blade which has a 32.5cm long blade with decoration by the spine. It also has a nicely decorated kaudi design. The belly depth of the blade is 6.5cm and has a stick tang horn handle. Weight guidance for the Tin Chirra is 575g-650g. It comes with 8cm chakmak & karda utility knives. The scabbard is supplied with tinder pouch and frogs. Click here for video description.